Have you been feeling the pull to love on yourself a bit more lately? Everyone knows that the more you radiate love and high-vibe energy, the more that same energy becomes attracted to you. In my quest to love up on myself more, over the past 3 days, I’d been planning to create a honey jar to sweeten my aura and draw more opportunities and high-vibe people into my space. There are quite a few ingredients that I felt compelled to work with and add to this jar. I spent a couple of days the week prior collecting some new herbs that intuitively felt in alignment with my intent. I’d planned to put everything together on the morning of the blood moon eclipse. However, the universe had other plans. Instead of working on my jar, I woke up with a strong desire to clean and purge. I ended up spending the better part of the day organizing my room, throwing things out, cleaning my altar and tidying up. Marie Kondo would be proud! Plus, I later found out that big eclipse energy requires letting go. Afterwards, I didn’t feel like doing anything but resting, and felt that since I’d done so much physical cleaning, and touching things that no longer resonated with me that I wanted to let go of, I thought it would be a good time to do a spiritual bath. I already had many of the items for my honey jar, so I figured this would be a good opportunity to test some of them out. My intent was primarily to let go of old stuff and to clear my energy to make way for the new-new —basically more self-love, more compassion for myself, and of course a highly attractive energy field. Boil on med-low 15-20 minutes, long enough to release the plants’ essence. *Fresh flowers and herbs can be used, no boiling necessary. Instead, you can give them a loving massage to release the natural perfume and oils. Cool & strain (Alternately, you can strain right into the tub if using it for a bath). In the tub add your bath salt. Pink Himalayan works wonders + your fave essential oils. I used moldavite bath salt + jasmine and rosemary essential oil. ALSO, I forgot to mention this on social, but I added some of my fave crystals in the bath with me while I soaked. I grabbed my rose quartz, labradorite, amethyst, moonstone, red tiger’s eye & moldavite. Make sure whichever ones you choose are suitable to be submerged. Some crystals don’t fare well in water. Burn your favorite incense. Again, I used moldavite (my favorite transformation tektite essence). Afterwards, try to air dry, and wrap up in something comforting or that make you feel your best. I did this bath on Sunday, which is ruled by the sun, so I chose a vibrant gold yellow cropped sweatshirt over my fave black bodysuit. One of my blogger baes DM’d me on IG to let me know she was planning to use hers as a Florida water. You can see her version in the video above. However you decide to use it, make it your own and remember— it’s more about the intent than following a stringent guideline. Your own spirit knows what you need. So, let that be your guide! Hit me up and send me photos if you decide to use this recipe and it helps you. I’d love to see your work! Want to take back your mornings for greater productivity? Check out my FREE 3-day mini-course The Sacred Art of Being the F*ck Quiet. It's all about creating space and pockets of quiet in your life, starting in the morning-- or wherever you can grab it. Solitude in our day is powerful. It's a space we can retreat to anytime we need to. And it's especially impactful in the mornings to give us the boost we need to create next level transformations in our life. Read the full article here on Griots Republic. Watch my story and other transformative testimonies about Muva Aya. on my Youtube playlist below. I know we’ve all had weekends or vacations that were SO epic that we needed a vacation after our vacation. That’s the kind of birthday weekend I just had. I celebrated my 40th Solar return on Sunday, and it literally wore. me. out. (Sidebar-- still, no kissing action though… but that’s another post. And anyways, my hopes are getting higher. This month is barely at the half. I ain’t took no calls-- except for 2 clients. I ain’t really posted on social. I hardly had the energy to sit up at my desk to write. A visual representation of how magical I felt this weekend. I’d completely forgot how healing work can cause you to feel all out of sorts afterwards. Even though my practitioner warned me ahead of time, I was still completely unprepared for the spiritual hangover that ensued. I was thinking I’d jump start my personal New Year with some major glow-up to let my aura bring all the boys and opportunity to the yard. So, I went and made all these plans filled with different energy work and healing modalities. I had a 90 minute reiki session on Saturday, followed by a 4 hour meditation hike on Sunday in the redwoods and several hours at the bathhouse getting my whole past, present and future body scrubbed and then kneaded like pretzel dough. And yes… it felt amazing during the sessions. My physical body was as soft as a newborns bum after. Plus, I slept like a baby fresh out of my mom’s oven. And then came Monday and it all came crashing down. I wanted to “push through,” I really did. But I literally could not. Now, I’m not usually one to complain about Mondays. But when Tuesday crept around and I was still wasn’t feeling it-- I started to get down on myself for you know, feeling tired from all the awesome I'd just experienced. But then, these beautiful memes came to me from some extraordinary folks I follow on IG and made me feel so obviously seen, and well... human. That's the thing I love about social, it's always there to remind me that we're not alone in these earthly struggles. And that it’s completely okay if, at times, you only have the energy to be in this body. It really is. 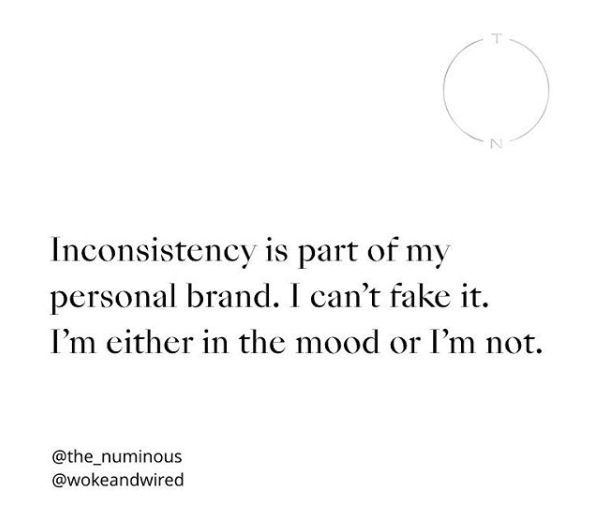 And as your accountability partner that’s exactly what I want to leave you with during this mid-month, mid-week Kiss & Grind check in. I want you to know, we ALL feel struggle in some way at one point or another. It’s okay not to be be on the grind at all times. It's okay to not feel like superwoman everyday. It’s not even realistic to think that you can be “on” every single day. That’s how we burn ourselves out-- whether through pushing ourselves too hard, or in my case, foolishly underestimating the magnitude and time it takes to ground and re-center after a self-initiated healing. The thing, is I KNOW this about energy work. The after effects are sometimes messy and can take a lot out of us so that it can be replaced and fortified with the strength and power that we need to live in our purpose and more fully. Bet no one has ever told you that. And because I too, am working on practicing what I preach, I’m going to ask something of you. I want you to promise, right here and now that the next time you feel like you are at a critical breaking point and you can’t carry on, please stop and check in on yourself. Call, text your accountability partner. If you need to, you can email me! Then ask yourself what you need to do for yourself to be alright in the moment? Is it a quick cry in the bathroom? Is it to go home and binge watch Netflix? Take a walk? Scream? Then give it to yourself. How's your Kissing & Grinding going so far? Leave a comment below or on social. Click here and let's talk about your dreams and how you can live a more high-vibe, well-balanced life. Summer is hot and the nights are long, let's make the most of them download and print your copy of Kiss & Grind today! Get on this month's email list you'll not only get tips on how to kick-a** implementing this month's productivity suggestions, but some real a** girl talk, straight from you know who. Hot August nights are upon us! It's my birthday month and idk about you, but I'm ready to let loose a bit. I had a dope reiki session with my boo, Fabulous & Grounded and one of the things that came up is that energetically, I've been putting out a real anti-social vibe lately. As a busy entrepreneur, I often go waaayyy over board and become borderline obsessed with my work and business projects. And, I know plenty well, that's not conducive to meeting new people and having some much needed fun. That's why, for my birthday month, I'm making a better effort to not only stay busy grinding and hustling, but maybe I'll do a little kissing as well. Aaaand, in order to do that, thou must get active. Hence, the theme of this month's calendar is Kiss & Grind. It's fully dedicated to making time for both, because life is about balance, right? RIGHT! Now go ahead, download and print your copy today! Let's twerk sumthin' & have some fun in the sun while the days are long and the nights are sultry!! Also, when you get on this month's email list you'll not only get tips on how to kick-a** implementing this month's productivity suggestions, but I'll be sharing all the (hopefully) sordid details of my adventures in dating. Will Tea kiss again? Stay tuned... the drought maybe coming to an end! How well do you balance being a professional boss babe and your personal life? Leave a comment below or on social. Click here and let's talk about your dreams and how you can live a more high-vibe life. I follow a lot of dope astrologers on IG, which is how I came to learn and understand, over time, the influence of Mercury Retrograde. Also, I've done a lot of reading up on it online, and of course, studied people and their actions during Retrograde season. And let me tell you something… y’all… we tend to SHOW OUT in all of our crazy glory during these energy shifts. During one particularly rough season, I was experiencing a very dark time in my family relationships and I. FLIPPED. OUT. That’s not to say that I wasn’t provoked. But what the experience showed me was that I needed to really do the internal, deep healing work in order to find resolution so that my spirit could feel at peace. ‘Cause ain’t nothing in the Universe random... I can honestly say this situation had been brewing under the surface for years, and the lid finally blew off. Thanks, Mercury! And while the overwhelming majority of things I came across about Mercury Retrograde (both public perception and information) were negatively colored --you know broke down communication, turmoiled relationships, travel havoc, electronic malfunction, and basically feeling in a murderous rage. The Universal Law of Polarity informs us that on the flip side, there is no way a planet that represents so much power could not be useful to us, even-- ESPECIALLY in a Retrograde situation. And, in the work that I do with mindset coaching, I firmly believe that we shouldn’t cower away from opportunities to strengthen our resolve or resist facing lessons that Mercury (or anything else, for that matter) have to offer. So, I pretty much changed the entire way I look at Mercury Retrogrades. While I had an understanding of the energy of Mercury, I knew I needed practical ways to work with this force for good, and not against it. From my studies of Hermeticism and psychology, I knew that dealing with our shadow self (muahahaha… Come to the Darkside, Luke! *rubs hands like Birdman*) represented TREMENDOUS opportunities to self-reflect and grow. Hence, the birth of the Mercury Retrograde Mindset Upgrade checklist. While I think it would be nearly impossible to retrace all of the steps and resources that I’ve read over the years that brought me to this “enlightenment,” I’ve curated a list of some of my favorite astrologers who I often go to when I want to read up on what’s shaking in the cosmos. @ChaniNicholas “is an astrologer, healer, artist, activist, writer. [She forecasts] astrology for radical, political, critical mystics. There are many, many other intuitives, tarot readers and the like who I connect with, but for the novice, this list is a good place to start. Mercury is one of the most powerful cosmic tools we have to transform the very thoughts, ideas, and perceptions that guide and shape our lives. It’s true. And this checklist outlines some key ways you can actively use the retrograde influence to come out on top, like every time. It's free to members of The Sassy Nation in the Creative Tribe Resource Library, and just .99¢ for non-members in the Gift Shoppe.